The coldest and snowiest places on earth pose a challenge to anyone visiting such locations as the Arctic Circle or Antarctica, but what about the year-round animal population? How do they cope for many months with life in these frozen wonderlands where temperatures can plummet to as low as minus 50 degrees? Gordon Buchanan, a wildlife cameraman used to filming in frigid lands around the globe, explains how creatures like the wolf, Arctic fox, bison, reindeer, lynx, weasel, polar bear, penguin, Weddell seal, and woolly bear caterpillar adapt to their surroundings or employ clever tactics to survive. Snowbound: Animals of Winter airs Wednesday, January 11, 2017 at 7p.m. on OETA-HD. After the broadcast, the episode will be available for limited online streaming at pbs.org/nature. In the opening segment, Buchanan is seen calmly stroking the thick coat of a wolf in Norway’s Polar Park where wolves have grown up with humans around so they are used to people. He shows how the wolf’s fine hairs provide much needed insulation, while its longer, outer hairs repel snow and water. Also helping to reduce a wolf’s heat loss, despite its paws being in constant contact with ice and snow, is an ingenious adaptation: an image displayed on a thermal camera illustrates that as a wolf’s warm blood flows down its leg, it cools down. This means only cold blood stays within the paws and all the warm blood can remain within the body. The arctic fox however has a different solution to keeping warm during the winter months: its thin brown summer coat undergoes an amazing transformation to one that is white, very fluffy and 200 percent thicker, the warmest coat of all arctic mammals. The film also cites hibernation as another cold weather strategy practiced by several animals including the brown bear, ground squirrel, and polar bear. Buchanan explains that even though a female polar bear’s heart rate drops dramatically in hibernation and she doesn’t eat or drink, relying solely on fat reserves, she can still give birth during this time. The cubs are kept warm by her body heat and grow quickly due to their mother’s extremely fatty milk. The wildlife cameraman is on hand as tiny twin cubs crawl out of their winter den to explore the outside world. 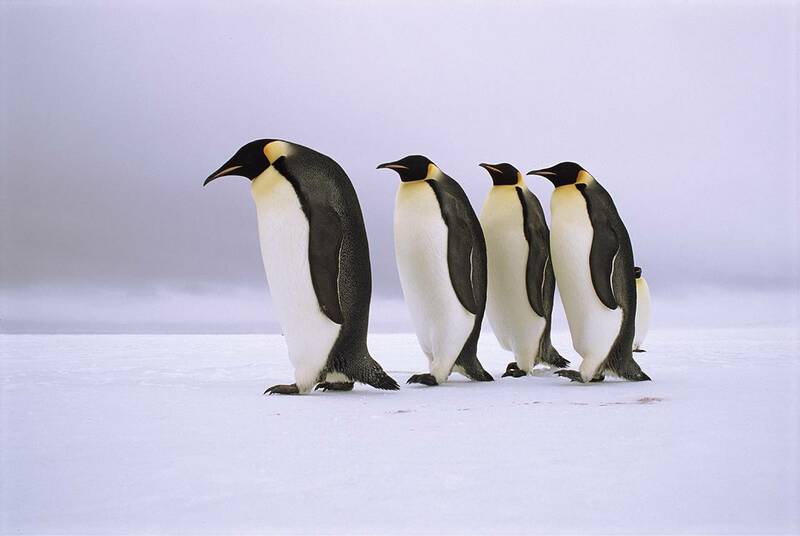 Possessing super senses gives other animals an edge when it comes to successfully hunting prey during the big freeze. Buchanan describes how a lynx can use its keen vision to spot a mouse 80 yards away or the benefits a reindeer has with ultra violet vision. He also remarks on how the great grey owl employs its super sensitive hearing to detect the movement of mice or voles beneath two feet of snow. Similarly, a young Arctic fox can pick up the faint sound of lemmings under the snow. To nab its unseen victim, the fox performs a special pouncing technique known as mousing. Buchanan says foxes align their pounce to the earth’s magnetic field in order to pinpoint the right spot for the kill. The film concludes with the remarkable metamorphosis of the Arctic woolly bear caterpillar that spends most of its life frozen stiff during the winter months and miraculously thaws itself in the spring, as if rising from the dead. Whether it’s undergoing a physical adaptation, using super senses, employing clever tactics to gain the advantage, or just being built for frigid conditions, these animals of winter not only subsist, but thrive in some of the coldest places on earth. Nature is a production of THIRTEEN PRODUCTIONS LLC for WNET. For Nature, Fred Kaufman is executive producer. Snowbound: Animals of Winter is a co-production of THIRTEEN Productions LLC and BBC in association with WNET. Nature has won more than 700 honors from the television industry, the international wildlife film communities and environmental organizations, including 17 Emmys and three Peabodys. The series received two of wildlife film industry’s highest honors: the Christopher Parsons Outstanding Achievement Award given by the Wildscreen Festival and the Grand Teton Award given by the Jackson Hole Wildlife Film Festival. The International Wildlife Film Festival honored Nature executive producer Fred Kaufman with its Lifetime Achievement Award for Media. PBS.org/nature is the award-winning web companion to Nature, featuring streaming episodes, filmmaker interviews, teacher’s guides and more. Support for this Nature program was made possible in part by the Arnhold Family in memory of Clarisse Arnhold, Sue and Edgar Wachenheim III, the Kate W. Cassidy Foundation, the Lillian Goldman Charitable Trust, the Filomen M. D’Agostino Foundation, Rosalind P. Walter, Sandra Atlas Bass, by the Corporation for Public Broadcasting, and by the nation’s public television stations.